“This was a fun project! 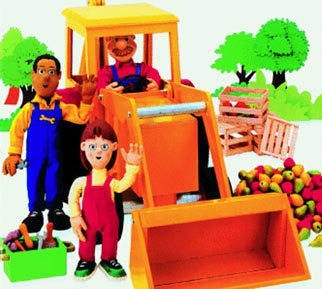 Dorling Kindersley, famous for their beautiful children’s learning books, asked me to come up with an animation concept involving two experts showing us round trucks and machinery etc. I said: “Okay but that all sounds pretty boring and unfunny and it won’t make a series. How about two blokes who make a mess of everything because they think they know what they’re doing but don’t?” And so ‘Dig and Dug’ was born. The only ingredient missing was someone who DID know what they were doing and could always be there to save the day – enter Daisy.